HOW MANY TIMES did you hit snooze on your alarm this morning? The fine art of sleeping well isn’t something that all of us can easily master. So much so that the sleep industry is now estimated to be worth up to $40 billion (€35 billion). Not getting enough sleep has such an impact on our lives, it’s even been found to trigger loneliness and social rejection. 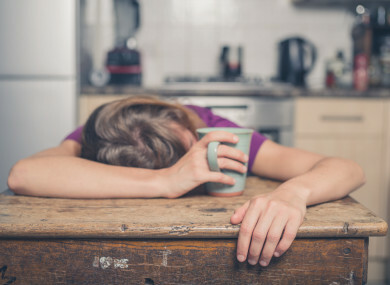 But it’s not a case of ‘the more the better’ either – another recent study linked too much sleep to increased risk of mortality from heart disease. So it’s important that we understand our own sleep habits. Last month, we launched The Health Check with Irish Life Health to get a sense of how you felt about both your fitness and your diet. And this week, we want to hear about how you’ve been sleeping. So, do you tend to wake up groggy or refreshed in the morning? Is your phone a constant bedside fixture? How do you sleep after a few drinks? And, what do you make of sleep-monitoring apps? How satisfied are you with your sleep, 10 being completely satisfied? When you wake up in the morning, how often do you tend to feel tired, 10 being 100% of the time? When it comes to your mental health, how closely connected do you feel your sleep is to your mood, 10 being completely connected? If you’re a slave to your alarm during the week, it can be tempting to try to use the weekend to catch up on sleep. But the research says that irregular sleepers are more likely to be overweight, have higher blood sugar, have a higher risk of heart attack and report depression and stress. So, how regular is yours? The National Sleep Foundation recommends between 7 and 9 hours sleep per night for adults. How often do you achieve this, 10 being 100% of the time? Advice from Harvard to improve sleep includes keeping the same wake-up time all week and avoiding electronics two hours before bed. How conscious are you about your sleeping habits, 10 being very conscious? A study during the summer found that sleep-deprived people are more likely to feel lonely and avoid contact with people. How much does a lack of sleep impact on your desire to socialise? Speaking of socialising, alcohol can result in a much lower quality of sleep and less REM (deep) sleep. How strongly would you say alcohol use affects your sleep, 10 being very strongly? The sleep industry has been hard at work creating products that will help us get shut-eye. CEO of smart bedroom technology company Sleepace estimated that the number of people using sleep technology will have doubled by the end of 2018. So, how does technology fit into your sleep? Is it a hindrance or a help? Tell us by rating below. The idea of sleep hygiene (habits that promote good sleep, especially creating a sleep-friendly bedroom) has gained a lot of attention lately. How likely would you be to use a screen (phone/laptop/TV) in bed, 10 being very likely? Some studies suggest that over half of Irish smartphone users check their device in the middle of the night. How likely are you to check your phone if you wake up during the night, 10 being very likely? How likely would you be to use sleep monitoring apps to track your sleep, 10 being extremely likely? Email “Fighting a yawn or feeling refreshed? Rate your sleep here”. Feedback on “Fighting a yawn or feeling refreshed? Rate your sleep here”.